NBA MVP LeBron James is trying to raise money for families affected by the December massacre at the Sandy Hook Elementary School by auctioning off sneakers he wore the day after the shooting. The sneakers he wore in Miami's game against Washington on Dec. 15 -- one day after the tragedy in Newtown, Conn., where 20 first-graders and six educators were killed -- are available in an online auction that runs through Saturday. Proceeds will benefit the Newtown Memorial Fund, through the LeBron James Family Foundation. 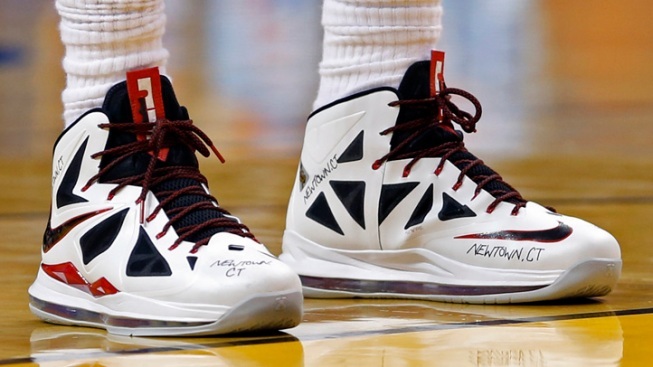 James' signature is on one of the shoes, and an inscription of "vs. Wizards 12/15/12 Never forget!!" is on the other. The auction is expected to generate at least $5,000.